3 Practices co-creators Jim Henderson (far right) and Jim Hancock (not pictured) conducted a two-day workshop to expose campus and community members to a structured and thoughtful way of talking about differences of opinion. UC Merced staff members, students and alumni participated in an experiment to help people gain a better understanding of others’ opinions without abandoning their own viewpoint or values. Getting people to talk about polarizing topics while remaining respectful was the goal behind last week’s “3 Practices for Crossing the Difference Divide,” a two-day workshop series designed to expose campus and community members to a structured and thoughtful way of talking about differences of opinion. Nearly 200 people registered in advance to attend one or more of the three workshops held on March 19 and 20. The event, hosted by the Office of the Chancellor, showcased how the 3 Practices technique works. Second-year environmental engineering undergraduate student Jose Lopez (center) shares his viewpoint during a 3 Practices workshop. A speaker in the circle got 2 minutes to state their opinion on the workshop topic. The other circle participants (and audience members) listened without interrupting. The questioner had 20 seconds to ask their clarifying question. The speaker had 1 minute to respond. The process repeated until each person who wanted to ask a clarifying question did so, and then started over with another circle participant getting 2 minutes to express their view. 3 Practices encourages people to develop understanding of each other, according to Associate Chancellor Luanna Putney. Initially, finding people willing join the circles and share their true, honest viewpoints was difficult, Putney said. Putney added that it takes courage for people to share opinions that might be uncommon or controversial in a certain setting. But when people understand the 3 Practices rules, it’s easier to engage in dialogue and dive deeper into issues. “As we deal with crises and national events that affect our campus, we are going to need this kind of practice,” she said. The 3 Practices method was born from The No Joke Project, a feature-length documentary; the book “No Joke: A Rabbi, an Imam and a Preacher Do the Unthinkable and Become Friends for Life,” co-written by Henderson and Cara Highsmith; and a series of live shows about the friendship between three clergymen in Peoria, Ill.
Putney said several people who attended thanked Chancellor Dorothy Leland for offering a program that allows different viewpoints to be heard. 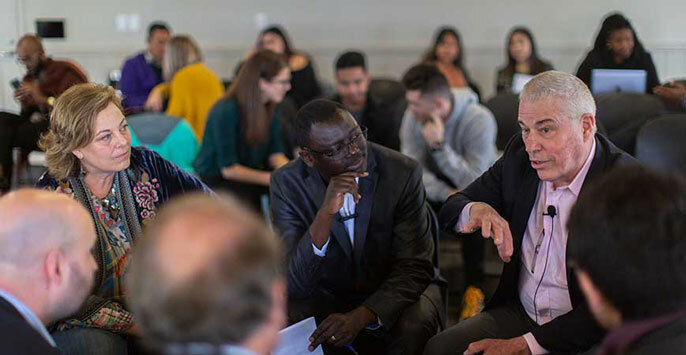 Attendees were asked to provide feedback about the series, which will help campus leadership determine whether bring the 3 Practices method back UC Merced to teach it to campus community members who could then serve as facilitators across a range of difficult topics. Jose Lopez, a second-year environmental engineering student from Echo Park, attended the first workshop as an observer. After watching the process during the first day, he returned the next day and volunteered to participate inside the circle during the remaining sessions.